Welcome! As a mentee in the ChiPy mentorship program I will be writing a few blog posts about my project — which was to learn how to implement a couple machine learning algorithms for execution on the graphics card. 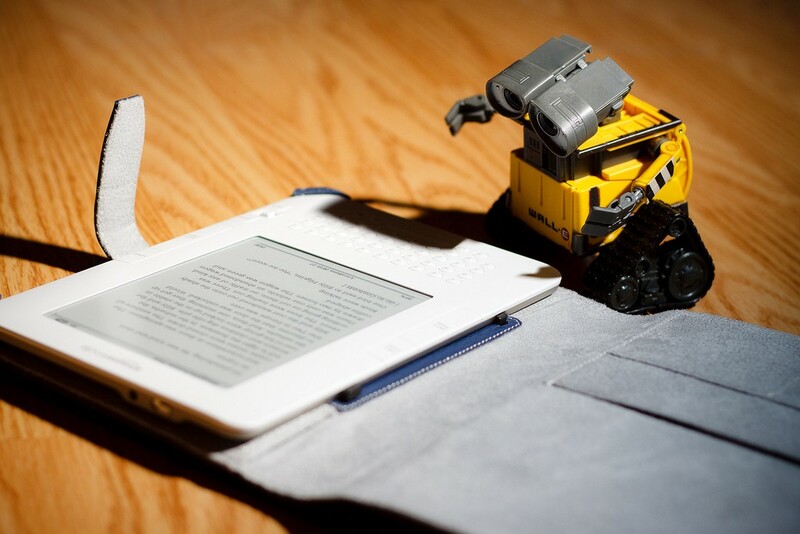 In this blog post, I’ll introduce a few concepts fundamental to machine learning using logistic regression as an example, as well as a code with simple implementation in Python and OpenCL interfaced with PyOpenCL. This post is intended for a broad audience; if you’re completely new to machine learning it may be worthwhile to read the beginning and mess around with the code on your own. If you’re here for the OpenCL, just jump right down to the bottom. And if you have any feedback, good or bad, let me know! If you would like to see the code I’m using, you can take a look at my github repository. Let’s get to it! There are many cases where it feels natural to attempt to model the outcome of an event as the probability that the event occurs, as we often record the outcome of some event as binary data. In addition, we may have some data that we hypothesize should correlate with the occurrence of said event. In medicine these scenarios arise frequently. Consider the case where a surgeon is deciding whether to perform a procedure on a patient. The patient’s health may improve considerably if the procedure goes as planned and the patient recovers but for some patients doing the procedure could actually be worse — they may be more likely to have some other medical complication that can’t be determined a priori, they may not be able to recover in a short amount of time after the procedure or they could be at greater risk for some other complication such as post-operative infection, significant blood loss to bleeding and slow wound healing. If the risk that the patient has one of these complications is too high, it would be in the patient’s best interest to not undergo surgery and find some other therapy. Experienced surgeons with many years of practice are often good at deciding when doing a particular surgery is too risky. But how can we use data about patients, physicians and properties of the procedure at hand (this is a post about modeling and prediction after all) to determine the probability of a bad outcome occurring? where X is our data and theta are the linear coefficients of each feature of the data. With this structure, we can start thinking about about how we would actually go about figuring out the values of theta, given a set of input and output data, as that will allow us to “learn” a map between our input features (X) and the output data (y). In the last section, we derived the logistic regression model and the underlying logic for how we can correlate observations with binary events. In this section, we’ll take a look at the math needed to actually fit the model. Before we get into specifics of logistic regression, I want to introduce a core concept in machine learning. Machine learning models are, in my opinion, mathematical structures that we use to think about how input and output data are related to each other; however the real power of these structures is that we don’t predefine everything about them a priori, we leave some internal parameters that we can tune like knobs on an analog radio to solve the problem at hand. However, this then raises the question of what should be the end result of this model building and knob tuning? In my understanding, that question has a clear answer: prediction. Our goal in any machine learning problem is to select or develop a model that allows us to “learn” a set of rules based on past observations for predicting future outcomes. Alright, I’ll stop being cheeky now and talk about some specifics for logistic regression, but in all seriousness, what I outlined above is the basic idea behind most (supervised) machine learning algorithms. Basically what we want to do here is maximize this function over a set of training samples (pairs of (x,y) from 1 to N), which means that we are adjusting the values of theta that would increase the overall likelihood measurement given our data. However, the first thing we need to do is write the right hand side of the equation in terms of X and theta; luckily we have that result from earlier so let’s just plug that in. Alright, this is looking better but the product still makes it a difficult problem to compute and solve. However, we can simplify this by taking the logarithm of both sides, turning the product into a sum. In the above pseudocode, alpha refers to the “learning rate”, or how large we adjust theta on each step. It can be tricky in practice to set and there are many schemes that use adaptive methods to keep the adjustment of theta big enough that we will decrease the cost but not so big that we may overshoot the global optimum. Overall the algorithm is pretty simple, and draws a striking resemblance to the silly “Learn Something” algorithm, right? In the next section, let’s see how this is implemented in Python. Before we do any fitting, we need to actually have some data. Since I want to make sure the code works I’ll be generating synthetic data that can definitely be modeled using logistic regression. The code for doing model fitting on the CPU is directly posted below, however it doesn’t look like Medium has any good solutions to get around its terrible code formatting. You can find a link to the jupyter notebook here. Well folks we’re finally here, and this is the meat of my ChiPy mentorship program project. Adapting machine learning models to execute on the GPU has lead to significant increases in performance for a number of problems in AI, computer vision and natural language processing, and interest in this area is surging. Don’t believe me? Look at NVIDIA’s stock price over the last year. I’ve been writing code in Python for about 6 years now, but I’ve never integrated code from other languages with Python and I figured this would give me a way to learn about that process as well as GPU programming. I have some well commented code to share for doing GPU computing with OpenCL and PyOpenCL for logistic regression but given Medium’s formatting I think it would be best to leave a link to that notebook here. However I’ll use this space to talk a bit about how OpenCL works. OpenCL is short for “Open Computing Language” — it’s very similar to C99 and is deliberately designed to execute in a highly parallel fashion. This can greatly speed up a large number of computations, basically any algorithm where the bulk of the work doesn’t rely on previously synchronized results. For example, large matrix multiplications, doing some processing of individual items in a large list, pairwise comparisons of long lists of interactors and classically “N-body” problems in physics simulations such as molecular dynamics. By breaking up the workload among a large number of workers and allowing all of them to run in parallel, we can save a lot of time. So what does the structure of an OpenCL program actually look like? 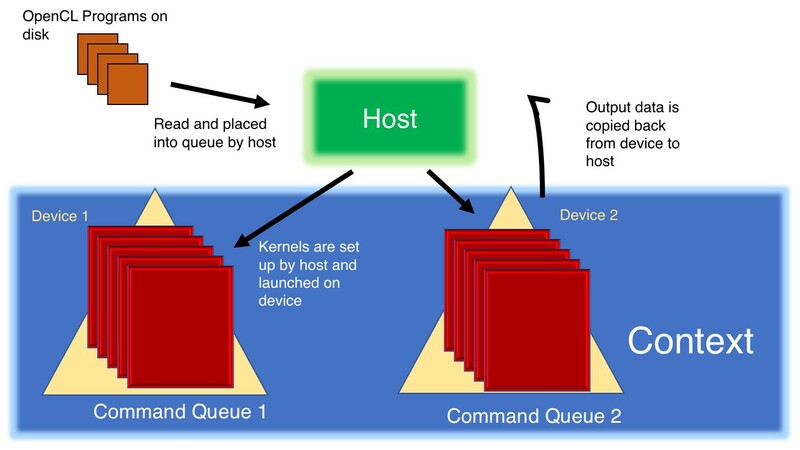 The hierarchy of the OpenCL workspace is as follows: context (a host program can launch multiple contexts), device (a context can hold multiple devices), command queue (a device can have multiple command queues) and kernel (multiple kernels can be sequentially added to a command queue). Notice how we never set up a for loop that does something like get the index of the array. When we set up the kernel, by specifying the global size of the workspace (which in this case could be the length of the array) OpenCL will launch a large number of these kernels on the GPU, which will all operate independently on their own subsection of the array. I hope that this blog post had something to offer for everyone, regardless of their level of knowledge about machine learning, Python and OpenCL. The code I provide in the jupyter notebook works but is by no means optimized, but I will continue to improve it over the course of the python mentorship program. In my next blog posts I plan to show OpenCL code that is optimized and can churn through large datasets with high performance. Stay tuned! The first equation is especially important — it provides a way to compute the expected value of our distribution using the structure present in the function b and we will exploit it later. where pi is our belief that the event y, which can take the value 1 or 0, will occur or be equal to 1. For example, in cases where we think the probability that our event of interest will occur is the same that the event doesn’t occur (eg tossing a fair coin) pi would be equal to 0.5. Ok, that’s great but this doesn’t look like it’s part of the family of exponential distributions! Not yet at least. Let’s do a bit of algebra. From here we can find a really important expression. Remember that the expected value of any member of the exponential family is equal to the first derivative of the function b (also called the cumulant function)? Right now it sort of looks like the second part of the term being exponentiated. We need to do a bit more algebra to find out. The right hand side of this equation is the log-odds ratio of the event of interest occurring, which is great because it makes the interpretation of the values of theta straightforward; that is, the bigger the value of theta for a given feature in our data, the more that particular feature of the data contributes to predicting the event of interest occurring. At this point, I hope I’ve convinced you of how we can use the properties and structure of the Bernoulli distribution to build a linear model for predicting outcomes of a binary event. However theory doesn’t get you too far in the real world so in the next section, let’s talk about how you would actually go about fitting this model and estimating what the values of theta should be given a set of data. You can also take this logic and apply it to other distribution such as the Poisson, Gaussian, Binomial etc to derive the associated link functions.